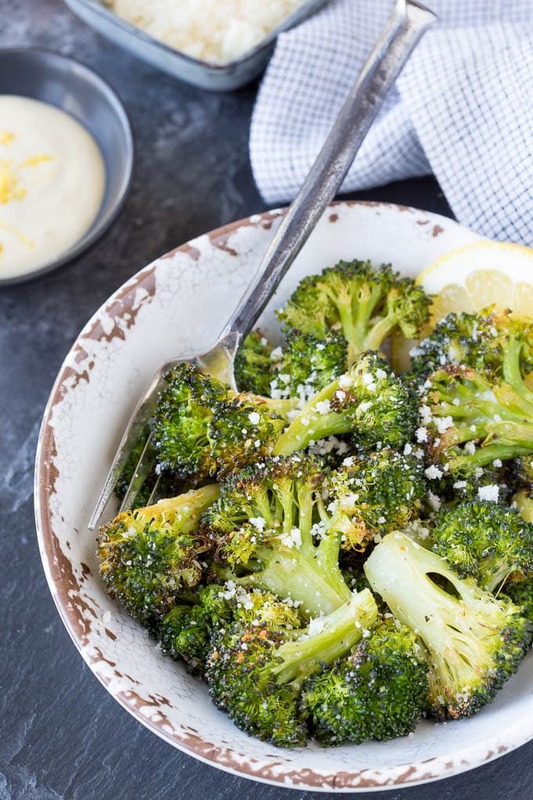 Parmesan Roasted Broccoli + Lemon Aioli – Seriously one of the easiest and tastiest side dishes EVER. Super versatile and sure to be a new “go-to”. Serve it as a side dish, an appetizer, or add to salads, omelettes, or even sandwiches. I can’t even count how many times I’ve made this Parmesan Roasted Broccoli. It’s super easy and beyond tasty. I’m pairing it up with a simple lemon aioli which makes a great dipping sauce ! Roasted broccoli tastes much different than steamed broccoli. What does roasted broccoli taste like? 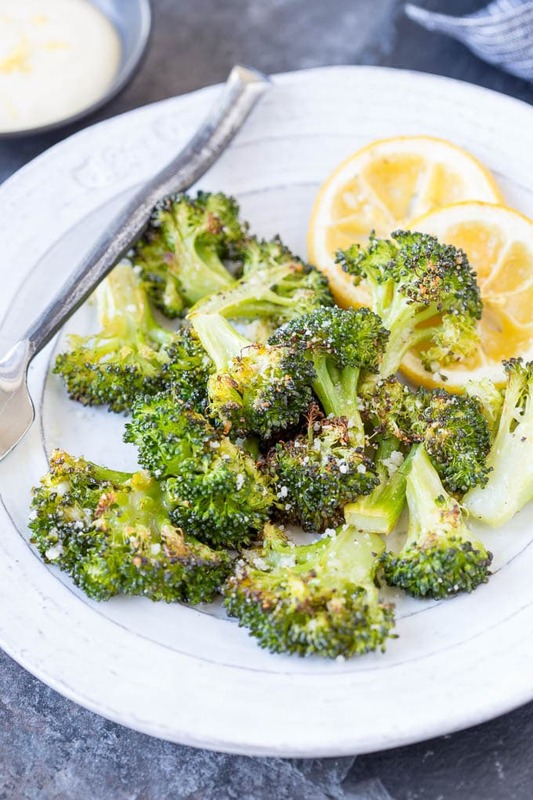 If you haven’t tried roasted broccoli before, you’re in for a treat! Something crazy/magical happens when broccoli gets roasted in the oven. It starts to caramelize and become sweeter. The outer edges of the broccoli turn slightly brown and become crispy. It may appear like the edges of the broccoli are burned and that’s exactly how you want them to look! The lightly smokey/charred flavor is so amazing! Roasted broccoli is best made with fresh broccoli (vs. frozen). You can buy broccoli crowns or pre-cut broccoli florets. If using broccoli crowns you’ll want to cut the crown into florets (how-to video here). You’ll want to cut the florets in half lengthwise (or possibly thirds if they are really large) from top of floret through the stem, so you have at least one “flat side”. This is one of those recipes that once you’ve made it once you really don’t need a recipe. Just remember 350F for 25 mins. The broccoli comes out perfect everytime! Cut broccoli florets lengthwise so they lay flat and coat with olive oil. Place on roasting pan and season with salt and pepper. Roast broccoli in oven for 20 minutes on 350F (flipping half way through if you like). 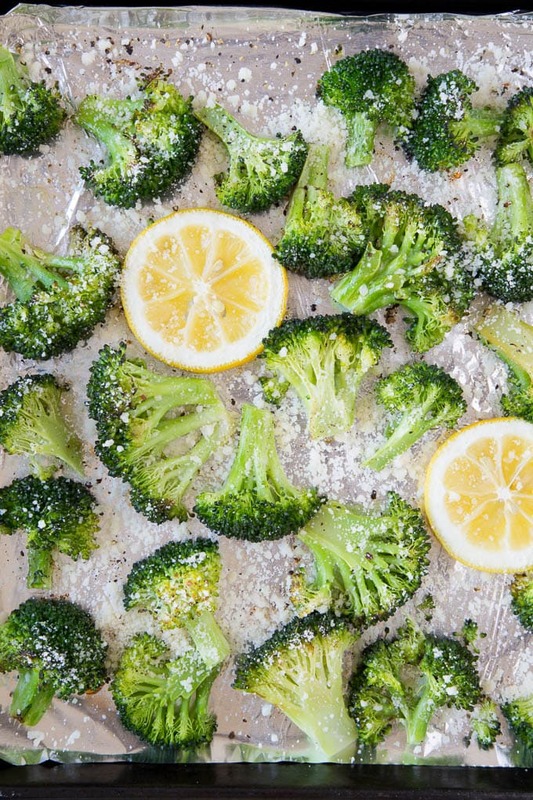 Sprinkle Parmesan cheese over broccoli and return to oven for 5 minutes. Can you tell I’m just swooning over roasted broccoli over here? There are so many ways to enjoy roasted broccoli. One of my favorite ways is to add a squeeze of lemon and serve it with a dollop of lemon aioli or dipping it in lemon aioli (recipe included below). Roasted broccoli (with or without the Parmesan cheese) pairs nicely with beef, chicken, salmon, pork etc. as a side dish. Toss some in your favorite salad or tuck some into an omelet with some cheese. I’ve recently been obsessed with roasted broccoli sandwiches. I know it sounds crazy but they are SO good! Sandwich together roasted broccoli, caramelized onions, spicy red pepper aioli , feta and baby spinach..game changer! Do you have a favorite way to eat roasted broccoli? The recipe works best with fresh (vs. frozen) broccoli. Frozen broccoli has a higher water content and I find the broccoli gets more “steamed” vs. “roasted” and you just don’t get as much of that great charred smoky, caramelized goodness . Make sure to spread broccoli out (flat side down) on roasting pan and leave space around each floret, so they can roast evenly. Flip broccoli half-way through cooking.. or not. Most people will tell you to flip the broccoli over half way through the cooking process. I usually don’t. I like that the flat side of the broccoli gets extra caramelized by remaining on the pan for the whole time. Either way works, it’s up to you. You can make this recipe with or without the Parmesan cheese. If omitting, roast broccoli for a total of 25 minutes (on 350F). Preheat oven to 350° F. Line a baking tray with aluminum foil or parchment paper. Set aside. Cut broccoli florets lengthwise so they lay flat. Place cut florets into a large bowl ( or ziplock bag) and add olive oil, mix to thoroughly coat broccoli. 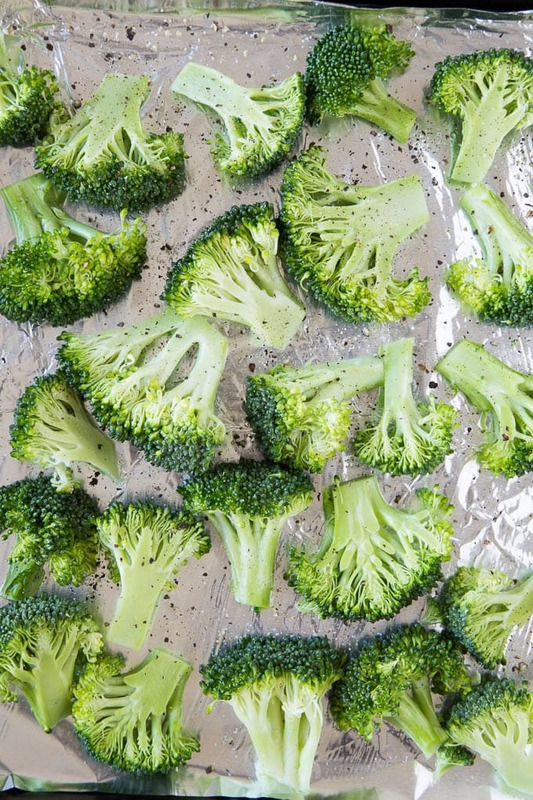 Place broccoli on prepared baking sheet, making sure to leave room between easy floret so they can properly roast. Generously sprinkle with salt and course ground black pepper. Place broccoli in oven and roast for 20 minutes( flipping half way through if you like). Sprinkle Parmesan cheese over broccoli and return to oven for 5 minutes. 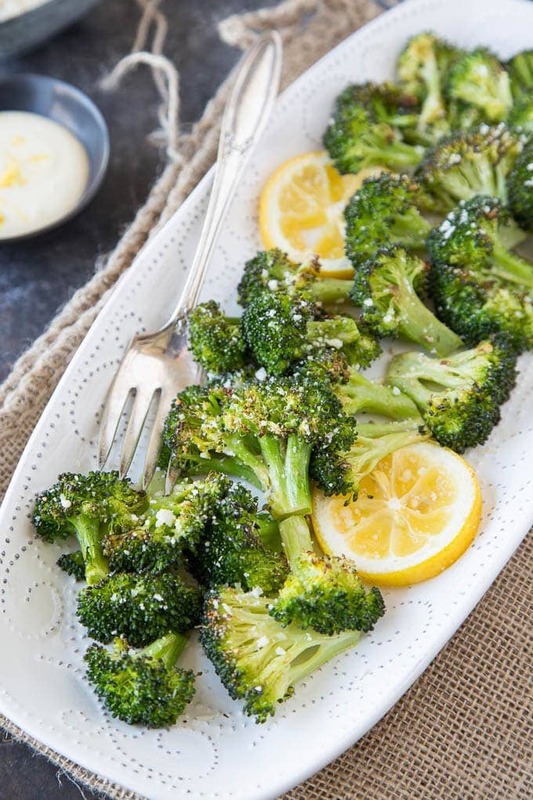 While broccoli is cooking, prepare the lemon aioli by mixing all ingredients (mayonnaise, lemon juice, Dijon mustard, lemon zest, garlic powder and salt & pepper) together in a small bowl. Set aside. Remove broccoli from oven and sprinkle with additional Parmesan cheese if desired.Serve with a dollop of lemon aioli on top or on the side( for dipping). 1) The recipe works best with fresh (vs. frozen) broccoli. Frozen broccoli has a higher water content and I find the broccoli gets more “steamed” vs. “roasted” and you just don’t get as much of that great charred smoky, caramelized goodness . 2)Make sure to spread broccoli out (flat side down) on roasting pan and leave space around each floret, so they can roast evenly. 4) Flip broccoli half-way through cooking.. or not. Most people will tell you to flip the broccoli over half way through the cooking process. I usually don’t. I like that the flat side of the broccoli gets extra caramelized by remaining on the pan for the whole time. Either way works, it’s up to you. 5) You can make this recipe with or without the Parmesan cheese. If omitting, roast broccoli for a total of 25 minutes (on 350F).